In the course of a century, people made a lot of predictions about the future of technology. Some were right—like H.G. Wells who, in 1903, described metal-hulled warships on land that could be considered the precursor to military tanks today; or George Orwell’s vision of 1984 (written in 1949), where the world was monitored by an interconnected web of security cameras; even John Brunner’s Stand on Zanzibar , who wrote his version of 2010 back in 1969, and it basically described the reality of 2013. Others were way off—like Ken Olsen who said no one would ever want a computer in their home back in 1977. Or the President of the Michigan Savings Bank who said horses were here to stay and automobiles would be nothing but a fad. Some, however, foresaw a future that stood at the cusp of possibility; like the writer who wrote a piece for the Lincoln Evening Journal called Looking Forward . In it, he describes 2017 as a world that is no longer dependent on coal for energy. The author envisioned a future where technology would be able to harvest energy from the sun and run it through pipes for electricity. Obviously, we’re not quite there yet. Our reality now is defined by a world threatened by climate change because of man’s dependence on energy produced from fossil fuels. Because of this, 2016 was the hottest year the Earth has ever seen since scientists began tracking temperature records in 1880. 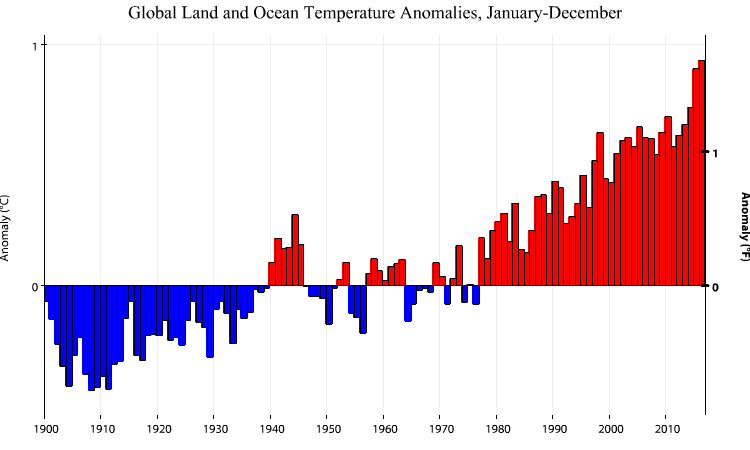 The planet’s carbon dioxide levels continue to rise considerably. And electricity generated from coal is still the largest source of greenhouse gasses. But we’re doing something about it. Climate change is serving as the big push we need to get to that point. In an effort to lower carbon emissions from vehicles, companies are working towards putting electric-powered cars on the road. Countries are actively doing something about reducing our dependence on coal, like China who just shut down 104 new coal plants. Solar power doesn’t necessarily go through pipes to deliver electricity, but it does exist, and it has proven itself more than capable of delivering our energy needs. In addition to this, we continue to develop sustainable alternatives to fossil fuels. Unlike the futurists from the early 1900s, we now have the technology to do something about a situation that frankly, we put ourselves in, in the first place. It’s now a matter of making it accessible and available for widespread use. A century ago, this writer believed humanity was going to do so much better for our environment–we’re in a position to prove him right.